Last night’s game between the Rams and Bears, a 15-6 victory for Chicago, has everyone talking about the power of the Bears’ defense. And with good reason! When you go out there and throttle one of the best offenses in the league in the middle of a high-scoring era like this one, you deserve to be the lead topic of conversation for the next week. There was, however, one moment of offensive genius in this game, and it didn’t come from the Rams. 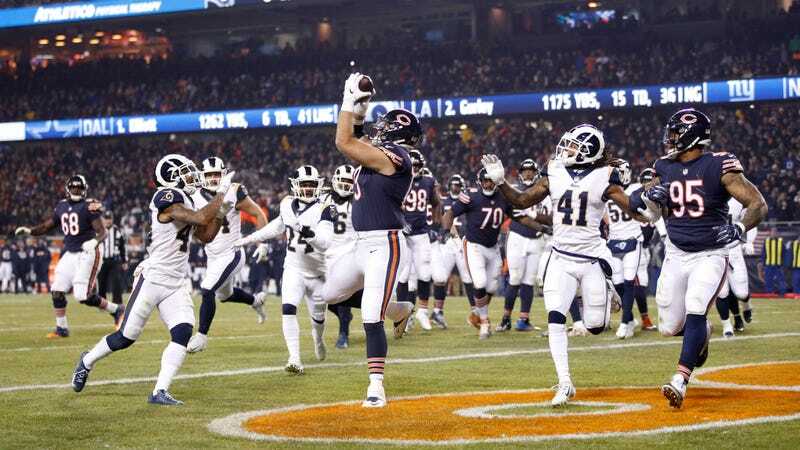 The game’s only touchdown was scored in the third quarter, when the Bears drove all the way to the Rams’ two-yard line and unleashed a trick play that ended with offensive tackle Bradley Sowell catching the ball in the end zone. You probably don’t need to look too hard at that formation to realize that there are exactly zero skill players on the field. No running backs, no tight ends, no wide receivers. The play featured five offensive linemen, Sowell lined up as a tight end, and three defensive linemen. Jonathan Bullard, Akiem Hicks, and Bilal Nichols lined up in the backfield behind Sowell, and Roy Robertson-Harris lined up as a tight end on the other side of the formation. The Bears scored a touchdown out of similar formation last week by letting Hicks do a William “The Refrigerator” Perry impression, and it looked like they were lining up to do the same thing last night. But head coach Matt Nagy added a new wrinkle, using a play fake to Hicks to clear out airspace in the end zone for Sowell. This week, Sowell — who plays catch with Khalil Mack before every game — knew that his number might be called. Matt Nagy tried a similiar play against the Patriots back in October, but it wasn’t until breakfast on Sunday when he was told they’d be running it again. What’s a defense even supposed to do against a formation like that? There were six offensive and defensive linemen lined up on the strong side of the formation, leaving the linebackers and safeties who had been sucked up to the goal line with a tough decision to make. Either sell out to try and stop the run, thus leaving tons of space for a big receiver to plod into and catch a play-action pass, or play it safe and end up on your heels while Hicks and his two gargantuan lead blockers come running at you. The best designed plays in the NFL are the ones that leave defenses with questions that have no good answers. “Uhhh, what are we supposed to do with all these huge guys?” is one of those questions, and Matt Nagy is cool as hell for allowing it to be spoken into existence.